This article describes the issue of the SRX device, which has configured VPN with SHA2 in the IPsec proposal, being unable to decrypt the encrypted traffic; even though it has established the VPN tunnel. Junos and SSG have two generations of SHA2-256 algorithms; the first one uses the 96 bit-length data field and the second one uses the 128 bit-length data field. ****** 07472.0: <untrust2/ethernet0/2> packet received ****** ipid = 172(00ac), @03e00db0 packet passed sanity check. flow_decap_vector IPv4 process ethernet0/2:10.10.11.1/37988->10.10.11.254/26434,50<Root> existing session found. sess token 16 flow got session. flow session id 16056 flow_decrypt: 359c890(b), flow_decrypt: 359c890(b)pipeline. IPv4 encrypted pak. Dec: SPI = 94646742, Data Len = 120 SA tunnel id=0x00000001, flag<02400063> chip info: PIO. Tunnel id 00000001 invalid esp payload length (60). drop. < SSG finds that the ESP payload length is wrong. invalid esp payload length (60). drop. 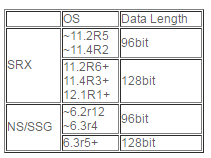 < SSG finds that the ESP payload length is wrong. For example, if a SRX device that uses 11.2R4 connects the VPN tunnel with SSG, which uses 6.3r4 or earlier, It works normally; but if Junos is upgraded to 11.2R6 or ScreenOS is upgraded to 6.3r5, the gateways fail to decrypt the traffic from others. Subsequently, traffic over the VPN tunnel will be dropped. 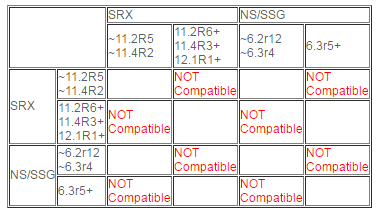 With the SRX family, this issue is noticed only with SRX branch devices. If the remote gateway uses 128 bit and the platform is NS/SSG, use set envar hmac-sha256-96=yes on the SSG side to allow 96 bit truncated message digest. In case of SRX/SRX VPN, use the same release on both of the gateways.